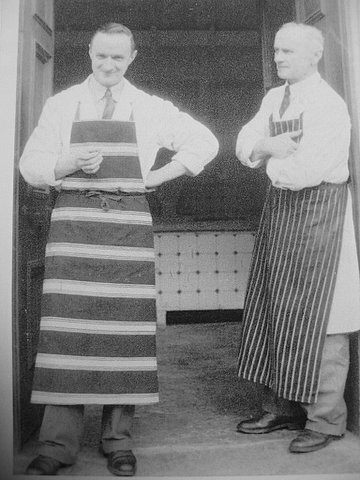 A photo of my father (left) James Mackenzie (Jim) and my grandfather Alex Mackenzie (right), who owned the butchers shop in the High Street of Invergordon from 1920s to 1950s, known as Mackenzie Brothers. Harry, wasn't the butcher shop across from Jock's known as Grants? It is this shop I was always told to go to when my mother sent me out for messages. I mentioned on another photo somewhere that the butcher here never ceased to amaze me with his ability to always slightly over-estimate how much he would put on the scale and always the same remark. "Now that's a wee bit over is that alright?" Over the years he must have sold tons more than he was asked for! Remember the butcher shop? - well...it is surprising how many butcher shops that used to be in Inver-g, I remember this one of course and others like Dalgarno's, run by Ben Dalgarno and later on by his sons Rossy and Ben, also Grahams, Willie Ross located on corner of King and Clyde across from Jock the barber...am sure there were others too that can't come to mind at present..
Hi Bill & Harry. Yes, the butcher's shop across from Jock's was called Grants. The business was run by Jimmy Grant (the butcher, he lived on Saltburn Road ) who rented the premises from Alec Graham; hence the Graham name being above the door. The Grahams also farmed at Colliemore (up the back of Invergordon). Talking of shops on King Street, I remember the Caley pub, Scottie Campbell (Cycle Agent), Roddy Graham (Chip shop), Bodell the Grocer, Dalgarno the butcher, Davie Lamb Photographer, Slaters the baker, Jimmy Grant butcher, Willie Ross the butcher, Jock the barbers, Charlie Donaldson Fishmonger and of course Johnny Boyd's the grocer's store - a very busy street especially when the fleet was in. Ok John, that clears it up. It was Grant's with the name Graham on the building. I got Willie Ross right....I worked at Slater's bakery - the baker was Jimmy from Aberdeen. Others working there were Davie Moir and Billie Russell. I didn't start work until 4am. I kneaded the bread and did the glazing, then to top things off I also made deliveries by bike before going to school at 9 covered in flour. I loved it as we used to have tea in a can and fresh rolls. Davie Moir used to sing "Unchained Melody" so that gives you an idea of the era. Yes John, King St was a busy street indeed. Hello Harry. Of course my Dad managed Slater's for several years. It was a combined Grocer & Bakers. Johny Boyd was the arch rival - but he was a bit more up market. Do you remember he had a coffee roasting machine and the whole shop had a lovely coffee aroma - very posh in those days. Slater's was part of a small chain based in Aberdeen. There really was a Mr Slater - I never met him but I know my dad did not like him and was eventually sacked. I was interested to see John's list of shops - he must have a very good memory. The other establishment in King Street was the public toilets half way down. I guess this was another facility introduced mainly for the masses of sailors who used to invade the town. Down the bottom of King Street was a prefabricated hall which was used for events. I remember my sister Audrey's 21st party being there. The hall was the base for the local Amateur Dramatics group. Scottie Campbell's main business was bicycle repairs (everybody had a bike in those days) - but he sold a few bikes too. John, I do not remember a photographer in King Street but I do recal "Duguid", a wee man with a spinal deformity who worked for the Ross-Shire Times and always attended any "official" occssion including Football matches, the Highland Games, Galas etc. He used a big plate camera which he lugged around everywhere. If they still exist he must have had a fantastic collection of Inverg photos. Billy, yes I remember the toilets - who wouldn't -they were most unsanitary. It was a treat when they were demolished and new ones installed further up the hill on King St. I remember now the baker's last name at Slaters - it was Carmichael. When did your father manage Slater's? Was it later in the '50s or early '60s? I remember Betty Murray worked in the grocery and she later married Hamish Dunn who was a 2nd cousin of mine.....I also don't recall the photographer on King St. - John, where was it located? My uncle managed Slater's for a short time in probably the late '60s/early '70s. There used to be a van too that went round the town. Harry - I also remember a photographer's in King St - I think it may have been Lamb's. It was in a small building on the right hand side going down to the harbour just after the Outram St. crossing. I don't know when it opened but was certainly there in the early '60s. The photographer referred to was Mr Lamb and his place was on King Street, just round the corner from Outram Street. Billy, I remember your father very well when he worked in Slater's. Hi Gavin, looks like you worked at Slaters prior to me - who was on staff then? Looks like you had the same job as me - did you also deliver the rolls? I remember the tea, great times working the dough etc. I took over the job from Norman Will, he must have taken over after you....Gavin these comments are for your Dad. Dads comments -------------Reading about Slater's bakery, brought back memories of me working there during the school hols during 1949/50. We started very early in the morning. I was the odd job boy cleaning utensils etc. Also "painting" the egg on the sausage rolls and making the tea which we all drank without milk. This was the start of my working life. Does anyone remember the printing shop on King Street opposite Dalgarnos butchers shop? Also can anybody tell what the heap of stones situated between King St and the chipshop on Outram Street and below Slaters bakery? Comments from Richard Borthwick - "It was so long ago that I can't remember many names apart from Billy Russell who had just started there as a full-time employee. I can remember the faces but I cannot remember the names." The heap of stones would have been the old prefab that lay below Slaters. King Street would have been a hive of activity in the war. Does anyone remember Bernards the naval tailors at the end of Outram Street - it was later Fosters the photographers? Annie Bernard stayed with us when my mum did bed & breakfast. Also my gran had the YMCA, later the Grange, which burnt down. I remember standing in the ticket booth with my dad selling tickets for a dance in the big hall and the sailors coming in for a game of billiards. I used to take my wee brother up the stairs, spin him round, shout ghosts and run away! Sorry Liz but that pile of stones were there before the war and the prefabs were made of asbestos. I thought that Bernards was in the row of shops at the top of the middle pier by the little cafe. There were at least two shops, one on each corner. Used to have some great dances in the YM hall. We also used to do some of our boxing training in the dancehall. We were also allowed to play on the billiard and snooker tables but with dire warnings that there would be H*** to pay if we damaged the cloth. Wasn't there also a Naval shop on the corner at the bottom of King Street? The photographer's shop must have been the wooden building across from Dalgarnos; but it had been a printers shop there, but don't know when. When you looked in the skylights you could see the presses and the trays of print. Harry, about the toilets (new ones) - was up there a few years ago and they were a disgrace. Don't know if there has been any improvement since then - I hope there was. Talking of Slater's Bakery..... Of course, your Dad Bill, I always remember being there. In the actual bakery I also remember Jock Forsyth who lived in Saltburn. He could really sing well. Also Davie Moir, who also married a Murray girl, Jessie. Billy Russell was a good rock 'n roll dancer and could fairly move around the floor. Remember them Harry, Bill and Richard (Nigel)? Doug, the toilets were closed the last twice that I was in Inverg. Murdo Hudson was passing and he kindly let us use the toilets in the Caley. I wrote to the Council and their reply was that they were only closed on two occasions! Yes Doug I remember Bernards ..as you say top of the middle pier by the cafe..In later years it did become a photographers - Fosters - if I recall. The naval shop at the King street end became Rhind's Grocers which in turn became part of a boat builders in the early 70s. I can confirm that David Lamb was a photographer based in King Street - he was my grandfather. My Dad built the studio beside the house they lived in on the corner of King Street/Outram Street. After he died (1970s) my Nana and Aunt ran a clothing shop for a while, but I don't think it's been used much for anything since. Can anyone remember the name of the business that was also in King Street 1970s era - it was a stationers(?). I remember James McGibbon working there? Hi Duncan, yes I can mind the store changing over to Rhinds grocery store. Last time I was up home, the first pier was in a right old mess - never saw the place look so dirty. Talking about butchers shops on King St., who had the one on the same side as Jock the barber between his shop and the High St? Hi Doug, was the shop between Jock's and the High St, not Charlie Donaldson's fish shop? When I first went to work for Post Office Telephones, his sister Sybil used to work as a telephonist in the Exchange, above the Post Office. Hi Doug, I'm not sure about this but could it have been Mackenzie Butchers, not the ones on the above photo but Tootie Mackenzie's husband? You might remember their son, George. Donaldson the fishmonger had the shop for a long time. I'm sure someone will put me right on this one. Doug, I can remember Charlie Donaldson's fish shop being between Jock the barbers and the High Street. There was a butcher shop opposite Jock's, run by Willie Ross (if memory serves), also one just down from Jock's on the Clyde Street corner - Grants(?) if I recall. Hi Doug, I remember this shop as a fishmongers run by Charlie Donaldson. I worked for a time in Boyds before starting nurse training, and I think it was a fish shop then - about 1956-57. Mr Boyd was a really nice man and so pleasant in the shop. My first pay was about 10 shillings a week. I remember the tins of loose biscuits and the coffee grinding machine that Bill mentioned. Sugar and cereals were stored in wooden bins in the back shop and were weighed and packed into paper bags. I spent many an hour at this job helping Charlie Fraser (Pandrop). Thanks all for the info on the shop; it most probably was a fishmongers. Just remembered that there had been a shop there. I left Inverg in late 1950 so memories are a bit vague at times. Nobody seems to know what the pile of stones below Slaters bakery was. I know for a fact that there was no prefab there. When I worked in the grocery store, Frasers, I was a message boy doing deliveries from the shop to the Cottages and Saltburn. I can remember once forgetting a tin of boot polish for a lady at the far end of Saltburn and had to return to the shop and then cycle out again with the tin of polish. Somebody mentioned that King St. would have been busy during the war. I can remember when the troops marched down in companies from the camps to the troop ships moored at the middle pier. These ships were all fast liners - remember some of the names being Lady of Man, Isle of Man the other names do not come to mind. You can imagine the noise hundreds of army boots with their steel tackets made on the cobble stones on King St.
Re my comments on troopships another two names come to mind HMT Aboth prewar linersmsterdam and Prague. Both of these were prewar liners. Hi Doug, what do you remember about the AN that was down the street from you by Sea-view? You must have seen it in operation, whereas most of us used it as a playground after the war.. Sorry Harry, what was the AN? Hello Doug, that was the metal frame that was in the patch of ground between the coal yard and the shore. I was told these were lights for the approach to Evanton airbase. Made a good playground for sure. Sorry, couldn't think what that was, chaps, but memories coming back. That area also had bofors guns in brick built shelters (just brick walls). There was also another of these gunposts between the middle pier and the dockyard pier. Also, at the top of the middle pier the RAF had an ammunition dump for bombs etc. Not very secure as we used to climb over the wire and go through the boxes for flares as they used to have parachutes to keep them up longer in the air. Many a blouse and knicker set were made with the silk from these. Rosalie - Jock Forsyth, Dave Moir, Billy Russell - I was a message-boy must have been before Harry. Jock’s wife worked in the shop with girl from Alness called Claire. Forgot van driver’s name. Gordon, you are right, Jock's wife did work in the shop which was in King Street but I can't remember Claire (old age)! It's nice to see that your brother's comments are next to yours! There was also Ross the Dentist round the corner from Jock the Barber's. One night, my uncle Vic Anderson of Pollo was cycling home after his Saturday night out, when he went over the verge onto the beach and lost all his teeth (false luckily). Ross the Dentist stayed up half the night making him a new set! Jock Forsyth was the van driver for Slaters Bakery in the '50s. The van was stocked with basic groceries and toured around local farms and country dwellings. Jock lived in a cabin in Saltburn and had a son called Melvyn who was in my class at school. My father used this van to practice driving (he never managed to pass a test) and every Spring he led an expedition to collect seagulls eggs on the moors behind the town (Inchindown and Scotsburn). I can't remember a single egg ever being found but I recall incidents of folks falling into the bog up to their waist....not much fun! Re the seagull eggs, David Bodell, myself and a few others used to cycle up to a small loch near Inchindown and gather the eggs in haversacks. I climbed up a tree and fell on one of the bags and smashed the eggs. Had a right old time cleaning the egg yuk inside the bag but it didn't take long to refill the bag as there were plenty of nests around. Hi Billy, the driver's exams back then were a joke, one had to be damn near perfect to pass them, so several did. Today they are too easy or at least easier. Re egg collecting, never collected seagull eggs but did collect duck eggs up on the moor at Newmore. It was Claire Fraser from Alness who worked in the shop, who married Kenny Gordon. My mother, Betty Dunn (McCulloch) also worked there at the time. Hi Yvonne, thanks for reminding me of Betty. In my mind I could picture her in the shop but I just couldn't remember her name. Betty, like her sisters were very attractive girls. Can anyone remember the name of the business that was also in King Street in the 1970s era - it was a stationers(?). I remember James McGibbon working there? I think that it was BEAM - Business Equipment and Methods. Dave Hughson and Ram Singh worked there too. Websters rings a bell but I think that was the tyre garage on the High Street. There used to be the a bookies shop on King Street beside it in the 1970s too. Yes, you're right. It was Websters then changed to Beam Office Equipment. James worked there, also Margaret Ross, Mary Cowan and the late David Hughson was manager. Does anyone remember Davie Slater? I think he drove Slater's van, could be his second name was Davidson, what a nice guy. The late David Davidson drove the big Slaters van when I worked there during my school holidays circa 1967. Always very pleasant on the van. Virginia Mcvittie drove the small one before that. I used to babysit for a Davie Davidson and his wife many, many years ago. He was a van driver and at times I was taken out for the day with them sitting in the back of the van and I recall that it always smelt of bread so he could well have been a driver for Slaters. At one time they lived in Joss Street before moving to Gordon Terrace I think. Hi, my Dad Davie Lamb had the photographic studio in King Street Invergordon. Our family Billy my brother (built it), My sister Kitty and Norma all live in the house next door. Across the road lived Charlie and Marion Rattery later Westfall family moved there. Further down stood Dalgarno's butcher Bodell's grocer and Graham's family chip shop. Opposite side further up stood the Hearn family, opposite front house lived Bunty Bell (Hilda Hylis's granny. Further along west Allan family lived Hamish Kath?? Friendly folks also along Outram Street too. I was the milk girl in 1960s knew every family in the town. Great families friendly folk. I left there in 1965, still live in Town. Sadly Mam and Dad have passed away, but cherished memories will be with me forever. Brill years in Invergordon. Jock Forsyth mentionned above was my grandfather. I was named after him. My father Melvyn still lives in Belgium. I still have a lot of good memories of my grand parents living on 35 Saltburn Road. We used to visit once or twice a year. Had a lot of friends in Saltburn at that time. Grand parents passed in 1993 and 1994. I’m a bit younger than some of you contributors hence my limited knowledge. such as Donny Dipper who lived next door, big Ian who worked at the smelter and annually I was a recipient of his discount from the smelter for a new bike. Rossy Dilgarno the butcher and Mr & Mrs Campbell the bike shop owners on King St. I was often commissioned to return the fish supper to John the Chippy at the top of King St by my father as it was a wee bit too greasy! Anyhow, the Caley was a vibrant place full of diverse characters- anyone remember the mad man - Man McKinnon?